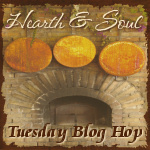 Welcome to the Hearth and Soul Blog Hop, the weekly blog hop for recipes for healthy and delicious comfort food recipes, as well as articles about healthy living, real / slow / local / sustainable food, foraging, herbal remedies, organics and gardening. If you are new to the hop, please read our Mission Statement and Guidelines. This week I am featuring three posts. Thank you to everyone who joined us last week. Right, on with the Hearth & Soul Hop! By linking to the hop you are giving me permission to feature your properly credited posts and photos here on The 21st Century Housewife as well as on Facebook, Twitter, Google + and Pinterest. Don’t forget to leave a comment so I can be sure to visit your post! Thanks for hosting April. Hope you’re enjoying your trip. Thanks for hosting Hearth and Soul! Hope you are enjoying your stay in Israel what a wonderful place to be. Your features look very good today and thanks for hosting! I wish I was with you in Israel. It is historic for all of us. I wish you could be here too, Chaya! It really is a special place for us all.